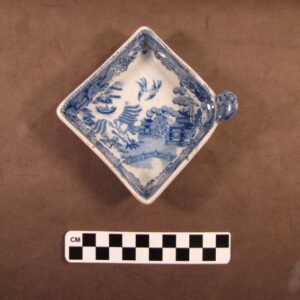 For more than 100 years, Trenton, New Jersey was one of the two major pottery centers in the United States. 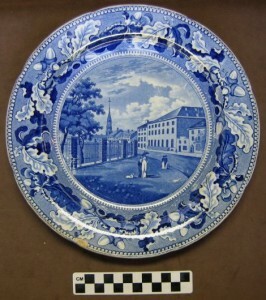 By 1880 hundreds of independent potteries operated within the city of Trenton, employing thousands of potters, modelers, decorators, gilders and designers. In response to the need for skilled workers, the School of Industrial Arts (most closely associated with the 1911 Cass Gilbert-designed Kelsey Building on West State Street) was opened in 1898 to train potters and other young people in their trades. 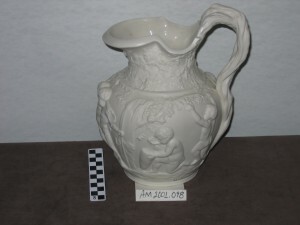 Mrs. Alice Maddock, wife of Thomas Maddock of the British pottery family, saw the need for ceramic models at the school for students to study – including objects that could be handled and patterns that could be emulated. 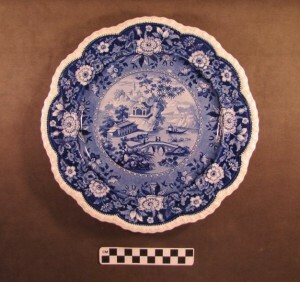 She had developed “one of the most comprehensive collections of blue and white china of the period contemporary with the Revolutionary War” which she bequeathed to the city of Trenton in 1902 for use and display at the School of Industrial Arts. The Trenton City Museum is proud to announce an exhibit of the Alice Maddock Collection as seen at the School of Industrial Arts in 1903. 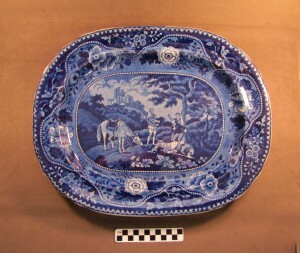 Over 200 pieces from her collection are on display including beautiful blue transfer print platters made by mid 18th century British potters, a Copeland parian pitcher with a molded design of putti gathering grapes ca1850, and a Mason’s Patent Ironstone pitcher with a peony and bird pattern ca 1820-1825. Some interesting pieces are included in the collection to demonstrate the early repair technique of using metal staples. To this constantly handled study collection, the years have not been kind. Some pieces were chipped, and some were broken and repaired but they are beautiful even with the scars of time. Other donors also contributed to the study collection at the School of Industrial Arts over the years, and pieces from their collections will be included in the exhibit as well. Edward C. Stover, a treasurer of the school, donated Chinese porcelains and other decorative arts pieces including a reticulated lobster on display. 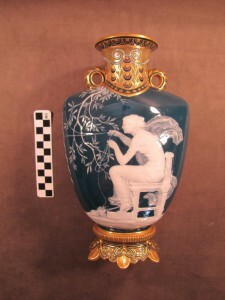 Edmund C. Hill, the man responsible for bringing Frederick Law Olmsted to Trenton to design Cadwalader Park, donated money to the school so that it could purchase important pieces including a Minton, footed urn pâte-sur-pâte on teal blue ground decorated by Leon Solon with a Greek goddess spinning and capturing a putti in her web. Members of the Pottery and Porcelain Manufacturers of Trenton raised funds for the purchase of the John Hart Brewer Collection in honor of one of the owners of Ott & Brewer, creators of some of the most outstanding art pottery in the United States, which they then donated to the school. In 1941, the School of Industrial Arts was renamed Trenton Junior College. In 1967, it merged with Mercer County Community College, and in 1972, when the college opened its new campus in West Windsor, the collection was packed away and moved to West Windsor. In the 1980s, Mayor Arthur B. Holland began a successful campaign to return the collection to Trenton to be part of the permanent collection at the Trenton City Museum, which had opened its doors in 1978. The collection as received at the museum has been cataloged by the volunteers of the Trenton Museum Society .